I was not going to post that, because it is just 1 little plain ball, that is nothing to show-post LOL. But I know that many ladies here like cats:). So I decided to post those pictures. My daughter was visiting me couple weeks ago. She took 8 more head bands and that ball- toy with her. I forgot to take pictures of those head bands. I ask her to take one or two pictures of those bands and send that to me. So far I did not got any of those pictures. But she sent me pictures of her Pandy (cat) with that little ball I give her. I did not asked for that picture LOL. I had one extra little ball, I was making a worm out of balls and I made one to many. Just before she left I added that little "string" so they (animals) can carry that around. Pandy as usual, took that ball and run on top of that step ladder with that. So the other cat & dog would not get that. Next day my daughter sew that little dog carrying that ball. As soon as Pandy sew that she went after that dog and took that awey!. Now I got an order for more tiny balls LOL. Pandy LOVES my crocheting stuff and she always takes away everything from the other cat & dog. PS: That step ladder became a permanent "fixture" in my daughter living room because Pandy likes that LOL. Our cat likes to climb on top of ladders too. 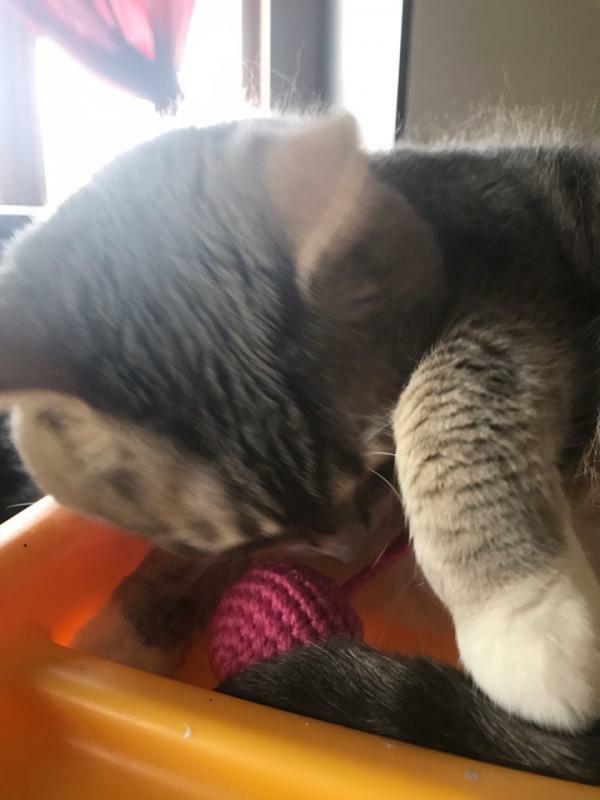 Love the kitty and her toys. I crochet balls with a curlicue tail for my cat but she isnt above helping herself to my stash. Adorable! The toy, cat, story ... everything is just adorable! I guess Pandy thinks she is the queen kitty! And cats love those small balls. I can't tell you how many my cats hide beneath the furniture and refrigerator, then they want more to replace the ones they can no longer reach. They must think we have an unending supply! Yes, Pandy thinks she is a queen. Those animals are funny.. . Thanks for the sweet story! 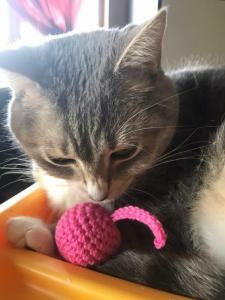 You've inspired me to make some kitty balls for our local Pet Shelter! What did you stuff it with? Pandy is such a pretty little thing and the ball is perfect for her. Pet Shelter that is a great idea. I used fiberfill. I buy that in a big bags a Joann for all my amigurumi. Sorry I could not reply sooner. My granddaughters are here. I did not even had a time to post my Easter Duck picture, I will do that tomorrow.